Do you live with an adolescent boy? Does your boy wear sneakers? Do his sneakers emit an odor that takes your breath away? IF you answered yes to these questions, then this Game Changer is for you. 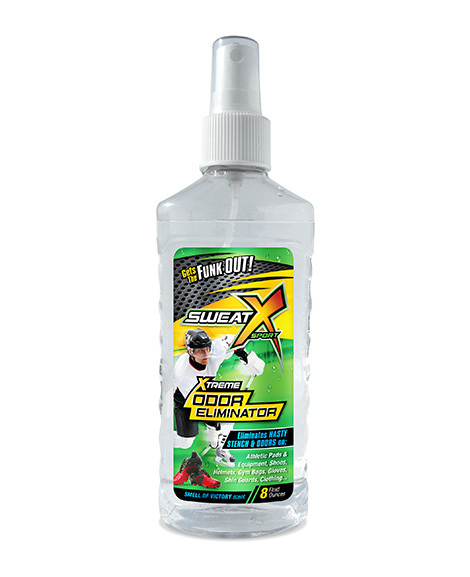 Sweat X Sport Spray is the extreme odor eliminator….really, it says so on the bottle. And the bottle doesn’t lie. It advertises that it ‘gets the funk out’ and does it ever. Boy Wonder’s shoe drawer smells disgusting. And once he left his soccer cleats in my car overnight. Dry heaving commenced. His life was threatened and he is no longer allowed to take his shoes off in said car. Cleats are kept in the garage at all times. No exceptions. I keep my bottle of Sweat X Sport in the mudroom…just a few feet from his shoe drawer. A few sprays into the drawer every few days and we can continue to live in harmony. God Bless the mama who invented Sweat X Sport! It’s $12.99 a bottle. Go ahead and stock up!